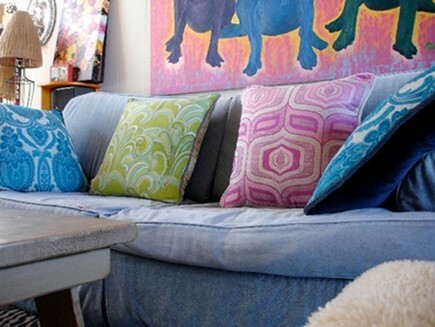 Vintage fabric pillows crafted from repurposed and vintage textiles are unique accessories. Earlier this week, my daughter showed me a picture from a friend and exclaimed “you’re going to want to write a shopping post about this!” I won’t say she’s right all the time, but in this instance she was spot on. Seems her west coast pal Andrea is lucky enough go to the Alameda, California Antique Show. There, she discovered the booths of Euro-Linens owners Eric and Daniela Davis. The couple fashions vintage fabric pillows among them, authentic French ticking fabric that is sanitized, soaked, rinsed and dried twice. Yardage in excellent shape is used to make mattress covers while damaged pieces become pillows or patchwork. 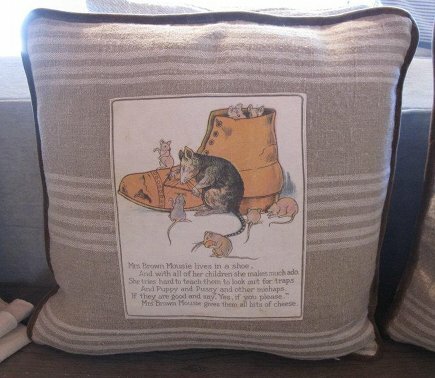 Antique cloth children’s books are repurposed into rag-book pillows. The pages are fused to vintage ticking and then sewn around the perimeter, producing one-of-a-kind cushions. 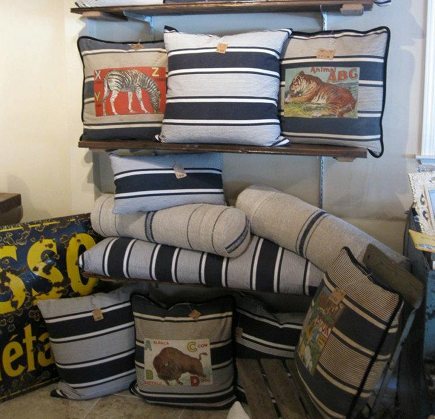 The backs of these vintage fabric pillows and the repurposed ones [below] are made from Dutch velvet curtains. Eastern European grain sacks are also hot-washed and dried before sewn to assure no shrinkage during future cleanings. Body pillows feature large buttons while smaller pillows have hidden zipper closures. There also are crisp white antique Euro shams made of linen and cotton. All pillows come with a down/feather fill insert for cushy comfort. The Davis’ also set up booths at the Rose Bowl, Paso Robles and various other shows and their Facebook page keeps fans informed of their schedule. If you’re in the area, stop by Patine, their shop in La Selva Beach, California. The store also carries accessories, furniture and artwork. They are all beautiful, but the rag book pillows are utterly charming. Down with pompous pillows! I love love the rag book pillows. Need to order at least one for Baby J and Baby E. I saw your recommendation on FB, so you must know the Davis’ and their products. The prices seem so reasonable too, especially for all the work that goes into getting the fabrics clean.